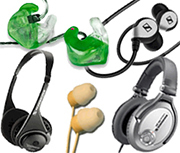 Earphones today have become a necessity for many people, and in numerous life situations. Whether you need a set of inexpensive earbuds for your iphone, or a quad driver in-ear professional musician monitor, we have a solution made for you. We are experts at making full custom earmolds that will make your existing earphones fit like a glove, as well as making top quality full custom earphones when you are ready to move up to a better headset. Browse the departments below. We are sure you will find some surprising solutions, and check back often. We are always adding new products to this department, where high tech meets great customer service. Tip: Earphones fit inside your ears, like earbuds and isolation earphones, while Headphones sit over the ear with a headband to keep them on. Our headphones all fit over the ear - as opposed to in-ear earphones, which fit inside the ear canals. For those who prefer not to have anything inside their ears, headphones are the best solution. Wedge monitors are a thing of the past; today, musicians use in-ear musician monitors, which allow for crystal-clear sound monitoring and also provide much-needed hearing protection. In-ear musician monitors are available in both full-custom fitted and universal fit models. Includes broadly compatible ear tips, accessories, replacement parts and add-ons, as well as brand-specific accessories from Shure, Etymotic, Westone and more.